I seem to talk a lot about filtering the noise of all the yammering online. I also talk about how silly most of the applications names are, but I figured this one was worth mentioning as it really helps you understand your Twitter followers. The Twit Cleaner (which is not a cheap prostitute for the Upper Class Twit of the Year) will run the most detailed analysis of who you're following that I've seen so far. If you're not someone who uses twitter a lot you may ask, "why do I need to look at who I'm following? Shouldn't I know these people?" The answer is, yes, you SHOULD know these people, but following people on Twitter is often a lot like exchanging business cards at a mixer. You think you understand who that person is, and you want to return the favor because they gave you their card, but now they have direct access to you. I'm mainly concerned with people who don't follow me back -- I follow people to have a conversation, or at least to have some mutual exchange of ideas. But there are accounts like the @MarsPhoenix or @stephenfry whom I 'm interested in, but I don't honestly expect them to be interested in me -- I don't want to use a tool that just automatically unfollows everyone who isn't following me, but I need a way to categorize the activity of the people I'm following. The Twit Cleaner has three main categories which they then break down into subsections. It takes a few minutes to run, and they actually send you a message when it's done rather than waiting on your browser like friendorfollow.com. I assume if you're one of those twitterers following 50,000 people that it would take much more than a few minutes. But the report you get back is pretty interesting. For completeness, here's the list I got back when I ran my report (knowing they're Aussies explains the terms and spelling). The page made it pretty easy to find out what accounts I wanted to toss immediately, and then take my time as I get through less and less critical categories. It also offers a tool to let you unfollow everyone on the list, with the option to exclude the accounts you want to keep (like the Mars rover and Sir Stephen Fry for example). 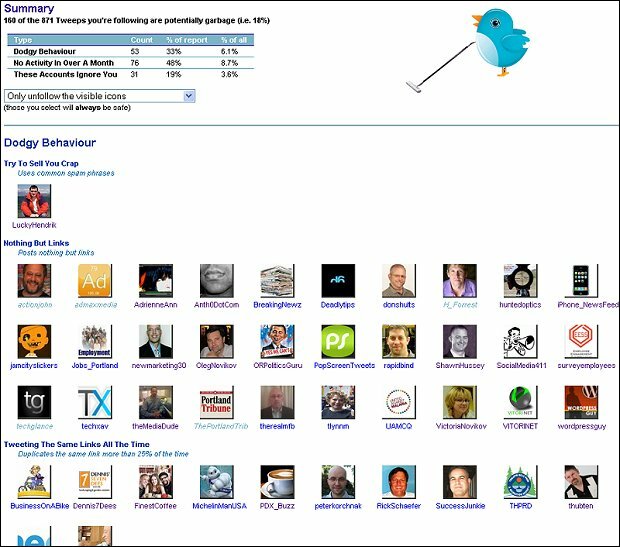 I did a quick paranoia test on myself by running the Twit Cleaner from the Conquent account (which is just a company placeholder and just follows @bissell) and I was happy to see that my daily Twitter account didn't show up in any of the garbage categories.